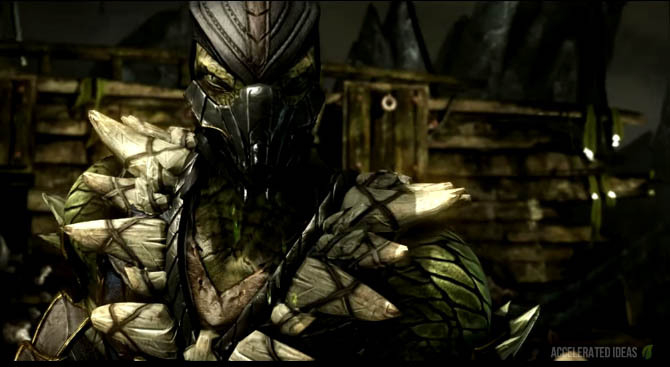 Reptile is the green ninja creature that's been part of the Mortal Kombat series since the very beginning, albeit he started as a secret unlockable character in the first game. 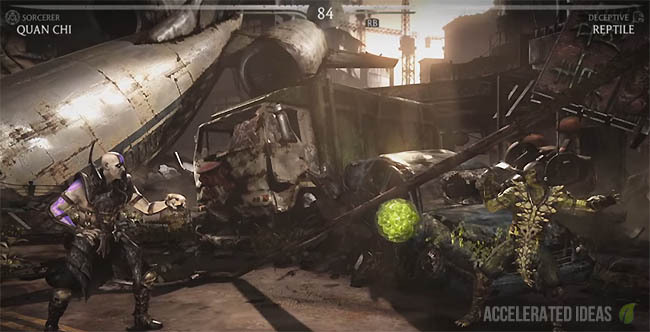 In MKX, Reptile is one of the core characters with three variations that include Deceptive, Noxious and Nimble. His core moves haven't changed drastically through the series but he's still one of the fans favourite choices. Reptile is a lizard creature by nature, frequently ripping off his mask to reveal his hidden reptilian face. His acid spit is notoriously famous, causing deadly injuries to those who stand in his way. In addition to this, Reptile has the common ninja moves such as slide, dash and pounce attacks. But the best of the bunch is his forceball, which slowly transcending the screen, setting up the most perfect framed attacks that give the enemy little or no room to escape. Of the variations, Nimble appears to be the most practical so far. It's special move allows the player to increase their speed whilst slowing down time for the opposing player. The screen turns a reptilian green, signifying that the Nimble perk is active. 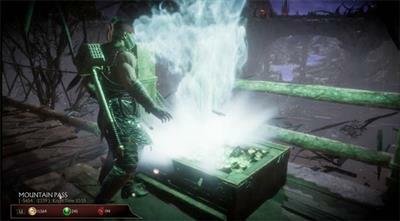 The classic stealth move has been classified into the Deceptive variation whilst the noxious variant gives the player a permanent AoE attack that inflicts light damage to an opposing player who's in close proximity. In this post you'll find the complete Moves List for Reptile including his Fatalities (and any secret fatalities). I'll also update this post to include his secret costumes and unlockable items. Launch a slow, floating projectile across the screen, which inflicts damage and causes the player to hurl forward when hit. The ball can also be stopped mid-flight. The classic slide move, which trips/sweeps the other player off their feet. A direct spit, straight at the other players face. Long range attack which is also fast. A hammer smash attack using the arms. Quickly dashes past the other player and punches them from the other side. Gain a temporary invisibility move in this variation. Turn invisible. Hold the button down for longer to go completely invisible. A permanent toxic cloud surrounds the player in this variation, inflicting limited but unblockable damage to the opposing player. This cloud can be increased in size using the variants unique move called Poison Gas. Increase the size of the noxious cloud. Gains the ability to temporarily increase speed whilst slowing the opponent down. From jump range, Reptile spits acid into the opponents face causing it to melt. He then dashes towards the opponent and rips their head in two.